One proposal for the Kingsbridge Armory in the Bronx calls for nine skating rinks. The battle to redevelop the Kingsbridge Armory in the Bronx is shaping up to be a two-team race. City officials received six bids to redevelop the armory, but only three were deemed serious. 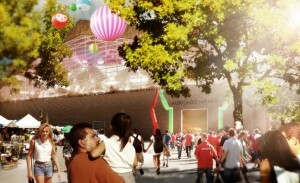 Of those three, two have emerged as leading contenders: A nine-rink ice facility proposed by a team that includes Rangers legend Mark Messier and Olympic gold medalist Sarah Hughes and a retail market that calls for the world’s tallest rock-climbing wall and space for a youth basketball program proposed by developer Young Woo. The city is expected to announce a winner early in the fall. Several storylines are emerging as Mr. Woo looks to close ground on the favored Kingsbridge National Ice Center group for the right to redevelop the 650,000-square-foot landmark building. Politics, of course, tops the list, as local elected officials torpedoed an earlier plan by The Related Cos. to turn the facility into a mall because of concerns retailers would not pay living wages. The skating group got a head start wooing politicians, taking them to Philadelphia to visit a youth hockey program run by the Flyers owner that it wants to replicate in the Bronx. But Mr. Woo has waged an aggressive effort to push his Mercado Mirabo proposal. He’s made presentations to the local community board and Bronx Borough President Ruben Diaz Jr. and has gotten the area’s councilman, Fernando Cabrera, who initially spoke highly of the ice rink proposal, to edge toward the retail project. “The councilman is looking very favorably at Young Woo, although there’s no handshake and no deal,” said Mr. Cabrera’s chief of staff, Greg Faulkner. Mr. Faulkner said his boss is leaning toward the retail proposal—which would include a Crunch gym, a six-screen movie theater, two 40,000-square-foot retail businesses and space for small specialty sellers—because he believes its variety of uses appeal more to the community than a skating-only facility. Previously Mr. Cabrera had told Crain’s that accessibility to ice sports would “lead to desirability,” among Bronx youth. Mr. Woo has teamed up with the New York Gauchos, a youth basketball program, and with the climbing outfit Brooklyn Boulders. His mixed-use proposal—patterned in part after the DeKalb Market in Brooklyn—also includes space for food stalls and creative vendors. “Our vision for the Kingsbridge Armory is based on our desire to respect and build on the history, culture and diversity of the Bronx, and we are confident that Mercado Mirabo’s broad range of uses can meet many of the community’s differing interests and needs,” said Mr. Woo. 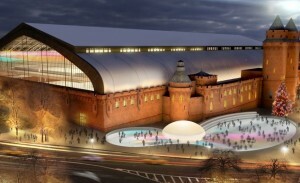 One proposal for remaking the Bronx armory is a retail market. Mr. Cabrera does not have a formal say in the final decision, which will be made by the city’s Economic Development Corp., but the project will need City Council approval. Council members typically follow the lead of their colleague who represents the district in question. “We’re in active negotiations with multiple respondents, and continue to make progress towards a selection that will achieve the vision for this important site by creating jobs and generating economic investment in the Bronx,” an EDC spokesman said. The thorny issue of living wage is also likely to play a role. The ice center team has pledged that all 220 of its permanent jobs will pay a living wage. Mr. Woo has said that Crunch has committed to a living wage and that his employees will also earn a living wage. But the two retail stores, the movie theater and the specialty vendors will not guarantee living wages, though some of them may pay such a rate. Mr. Diaz, who helped persuade the city to put out a second request for proposals on the armory after the Related project was rejected, is still reviewing the projects and has not made a decision on which one he will support, according to a spokesman. Mr. Diaz was at the forefront of the living-wage push, and is likely to look favorably on a project that makes guarantees of a higher minimum wage. Councilman Oliver Koppel, whose district lies just outside the armory and who sponsored the living wage bill that passed in the City Council, said he is leaning toward the ice proposal. Both feasibility and economic impact will also be weighed. The ice center project, with four elevated rinks on a mezzanine level, is the much more expensive endeavor at an estimated $250 million. The retail center, which maintains most of the current drill floor and involves far less infrastructure, is projected to cost about $100 million. The risk may be greater on the ice-rink front, but the potential payoff could also be bigger. The developers estimate it will create 1,800 construction jobs and an influx of people from out of the area could bolster local businesses. “KNIC is an ambitious project that will generate hundreds of living wage jobs, bolster neighboring businesses and create valuable educational and athletic programs in the Bronx,” said Kevin Parker, founding member of the ice center’s development team. “The hockey thing, even if it brings in outsiders, they’ll go to restaurants, they’ll go to stores,” Mr. Koppell said. Marlene Cintron, president of the Bronx Overall Economic Development Corp., said that in addition to boosting area businesses, the ice proposal could also help bolster the image of the Bronx around the world. Clarification: Developers proposing to remake the Kingsbridge Armory in the Bronx describe their project a retail market, not a mall. That was not clear in an earlier headline on the article, “Retail market emerges as skating rink rival for Bx. site,” published June 22, 2012.